NJB Article and Source Repository: What’s the Matter with Liberalism? By Mike O’Connor. What’s the Matter with Liberalism? By Mike O’Connor. What’s the Matter with Liberalism? By Mike O’Connor. History News Network, March 22, 2016. New York Times columnist Timothy Egan recently wrote that Bernie Sanders’s campaign for the Democratic presidential nomination has made “the word socialist…no longer toxic in the United States.” Perhaps ironically, the same cannot be said for the word liberal. For decades now, conservatives have gotten political mileage out of characterizing liberals as latté-sipping fops who despise religion and the family but love wasting other people’s tax dollars on their social engineering schemes. Democratic politicians have implicitly endorsed this characterization by putting distance between themselves and liberalism in their self-descriptions and policy choices. Many liberal voters, in turn, have turned away from this term because they do not want to associate themselves with the feckless politicians who, they believe, do not do enough to advance the values that are important to them. While Republicans think liberals are too radical, progressives find them too squishy. 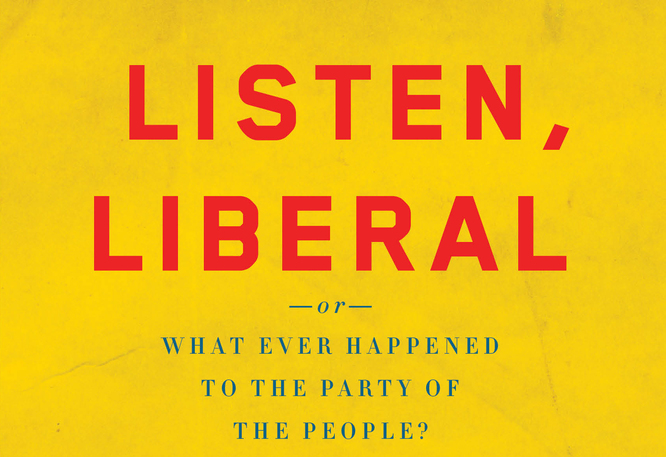 Thomas Frank is clearly in the latter camp, as he explains in his new book, Listen, Liberal–or–What Ever Happened to the Party of the People? As the founder and former editor of The Baffler, one-time columnist for The Wall Street Journal and Harper’s Magazine, and author of 2004’s What’s the Matter with Kansas? (among several other books), Frank has never been shy about criticizing the inane celebrations of the business class, the phony populism of the self-serving culture industry and the duplicity he sees at the heart of the conservative project. In his latest book, Frank turns his gaze to the recent history of the Democratic Party, and he does not like what he finds. Specifically, he argues that its elected officials and house intellectuals have done little about the issue that, he believes, should be defining the nation’s contemporary politics: income inequality. Inequality represents, in President Obama’s words, “the defining problem of our time.” As a concept, though, inequality is but a shorthand for a nexus of contemporary problems. George Packer compellingly describes this phenomenon as “the unwinding” in his 2013 book of that title, while Frank prefers the Victorian phrase, “the social question.” Regardless of the name, however, Frank locates in inequality “the reason why some people find such significance in the ceiling height of the entrance foyer and the hop content of a beer while others will never believe in anything again.” Over the last thirty or forty years, he avers, the lives of working people have become “wretched” and “precarious.” Yet in the face of such a catastrophe, argues Frank, Democrats “cannot find the conviction or imagination to do what is necessary to reverse” the tide of inequality. Instead, they emphasize the role of impartial, uncontrollable factors like technology and globalization, arguing that these problems can best be faced by obtaining the training and skills necessary to compete in the modern workplace. Frank argues that the source of the Democratic Party’s change in priorities has been a shift in its self-understanding. The party of Franklin Roosevelt once defined itself in class-oriented terms, as the representatives of workers in their battle against the “economic royalists.” Today, however, the party owes allegiance to a different group. “The deeds and positions of the modern Democratic Party,” Frank argues, “can best be understood as a phase in the history of the professionals.” The interests of the working class once defined the Democratic Party, but that time has passed. Today, it is the concerns of the professional class that set the Democratic agenda. The central figure in this narrative is, of course, Bill Clinton. The nation’s 42nd president found his positions by “triangulating” between liberal and conservative views, articulating a new “third way” of American politics. Historians have just begun taking up the period of the 1990s. So far they have generally characterized Clinton somewhat positively, presenting him as an innovative figure who responded to a changing world by revitalizing a tired doctrine. In The Age of Reagan, Sean Wilentz presented a Clinton boxed in between, on the one hand, the conservative revolution represented by Ronald Reagan’s presidency and, on the other, the “self-deluding Democrats’ unrealistic assessments and expectations.” Triangulation, on this interpretation, was a “means to revive and reinforce the refurbishing of American liberalism.” Gil Troy approvingly quotes Al From, Clinton’s guru of centrism, in his claim that the president “saved progressive politics … by modernizing it.” For these historians, Clinton was liberalism’s savior. To Frank, though, Clinton was responsible for the death of an essential part of liberalism. “Erasing the memories and the accomplishments of Depression-era Democrats was what Bill Clinton and his clique of liberals were put on earth to achieve.” One of the president's favorite sayings was that “the world we face today is the world where what you earn depends on what you can learn.” This reflects, in Frank’s interpretation, the core New Democratic principle that “you get what you deserve, and what you deserve is defined by how you did in school.” Given such a premise, which is “less a strategy for mitigating inequality than it is a way of rationalizing it,” it is hardly surprising that Democrats have little interest in championing the cause of workers. Over the last several decades, many liberals and leftists have expressed dissatisfaction with the Democratic take on economic issues. What makes Frank’s book new, different and important is its offer of a compelling theory as to how and why the party of Jefferson, Jackson and Roosevelt is now so unlikely to champion the economic needs of everyday people. The Democratic abandonment of economic issues, Frank helps us understand, is due neither to cowardice nor to corruption. It is instead an expression of a coherent and consistent philosophy, albeit one that might not be terribly progressive. Today, conservatives who are themselves extremists caricature liberals as extremists. At the same time, would-be consensus builders decry partisanship and suggest that the best policies are to be found midway between the two major parties, without regard to what these parties support. 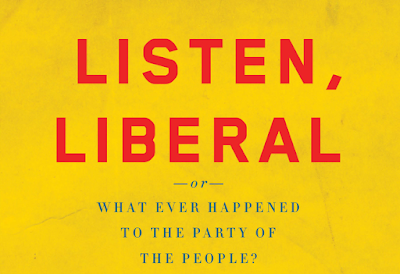 In such a looking-glass world, Listen, Liberal is a desperately needed corrective. Mike O’Connor is a history adjunct in Georgia and author of A Commercial Republic: America’s Enduring Debate over Democratic Capitalism. He blogs at the website eight hundred words.